Injuries, dangerous occurrences and material damage arising from lifting operations account for a significant proportion of the total of those occurring offshore. Half of the significant events in the oil and gas industry are related to material handling or crane and lifting operations. Since the 1988 Piper Alpha disaster, the offshore work activity that has killed and injured the most personnel is mechanical handling and crane/lifting operations. 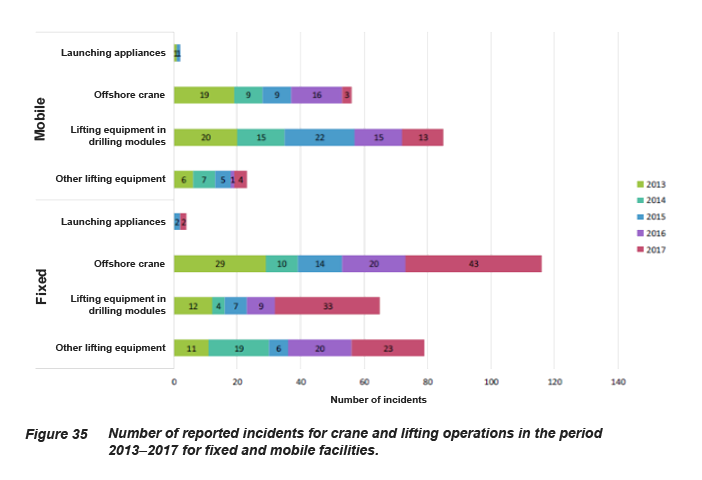 Between 1994 and 2017, 10 out of 16 fatal accidents were related to crane and lifting operations. Norwegian laws and regulations relevant to offshore activities have immense focus on safety measures. The main duty of the PSA as a regulator is to prevent incidents and major accidents, and above all disasters like Piper Alpha, Deepwater Horizon, and Kielland. To ensure that HSE regulations are adapted to new industry processes and solutions, amendments are being made to the regulations all the time. Such amendments are typically based on internal specifications and procedures of the operator companies. But one might ask, to what degree can a “zero injury” philosophy be achieved by these specifications and procedures alone? Although the industry and petroleum safety authorities have worked systematically during the last decades to reduce the number of lifting incidents, they still seem to occur on a rather regular basis. The use of lifting equipment in the Norwegian sector is covered by Ptil AF §92, HSE Directive 4 Lifting Operations and the NS-EN 13852-1:2004 standard. Figures from the 2017 study on trends in risk level in the petroleum activity (RNNP) show progress for several risk indicators. But there has been an increase in the number of serious personal injuries, as the figures below illustrate. The number of offshore incidents for 2017 has almost doubled compared to 2016. Why is this? In the second part of this article we take a look at some possible causal factors as well as how you can reduce risk in crane and lifting operations.